This is a guest post from Nuala Fahey, who blogs here. Nuala is (in her own words) a geeky feminist Irish woman living in Scotland. She has two daughters, and a lot of yarn. She really likes hummus. I never intended to be an always there mum. Before I had kids I planned to work at least part time and after having my first that was indeed what happened. But when I was pregnant with number 2, the after effects of a certain Scottish bank nearly going bust made its way down to my corner of IT and I got the chance to leave. Much to my surprise, I took them up on the offer and there I was. At home with 2 kids. But still in a very privileged position as the kids’ dad worked part time and we still had childcare so I was rarely alone in the house with both kids for long. But then he got another job and as I wasn’t looking for work, it became harder to justify sending older kid to her childminder. And I missed her. So I became an always there mother of a 4 year old and a 1 year old. Which was great and exciting, but suddenly there was never any uninterrupted time. I never got to finish the page of my book, the row of my knitting and I especially never got to do the sort of cooking I have always enjoyed. The fiddly sort which involves lots of chopping and making of sauces and is totally incompatible with the wailing toddler on the other side of the kitchen safety gate – our tiny galley kitchen is too small to let her in safely. At first this disappeared in the noise caused by the shock of how hard I was finding 5 days a week with the two of them, but as I started to build a routine and feel like I could, on a day with a following wind, do this, I really started to notice that nothing ever got finished. I mean, the kids were dressed and fed and got out of the house every day but there was nothing non-child related that I could point to at the end of the day and say I had completed. This was what I missed from my paid work days. That sense of something done. I didn’t get it every day but I did get it often enough to feel that need was being met. I flailed around and got frustrated with the kids and tried to give them toys to distract them or to get them to play with each other. But the more I tried to carve time out for myself, the more the kids wanted to be where I was, to see what I was doing and to push into my space. I could do cake and biscuit making with the 4 year old but the toddler was just too small and would sit in the hall getting upset as we hurried through our recipes. Then one day, on a hungry whim, I decided to get a book on bread making out of the library. 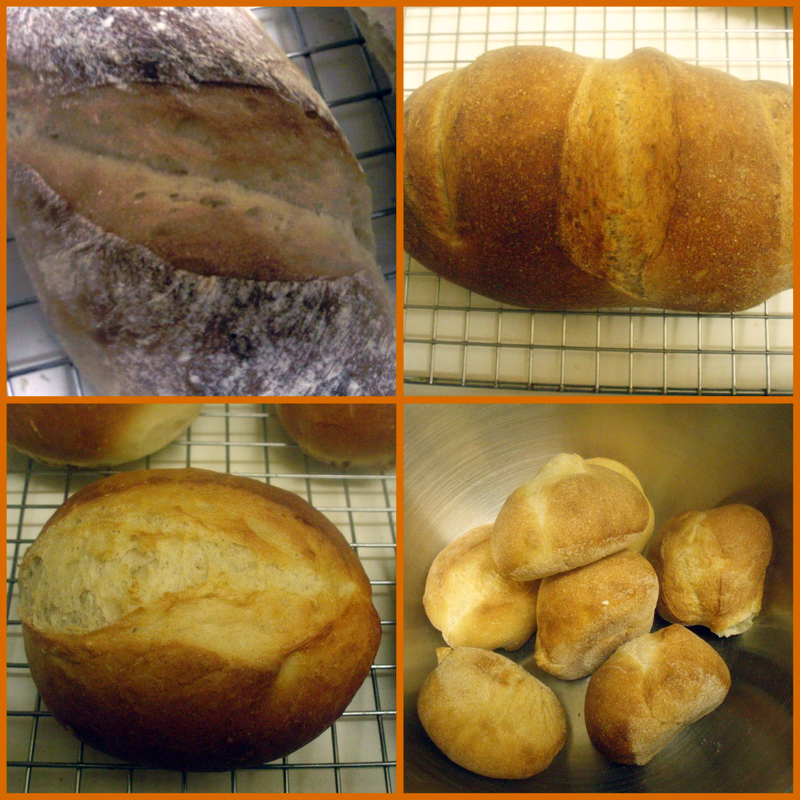 I had dabbled in bread making on and off over the years but used to find the stop and start nature of it annoying. I would make a loaf or two, get annoyed with how long it took and go back to store bread. I expected this time would be the same, but the book was beautifully produced, with lovely pictures, so I decided to give it a try. I expected it would be another frustrating kitchen session, but my hands were itching to make something, so I gave one of the small bread recipes a try. And it turned out great. Because I had finally found something that was basically infinitely interruptible. I’m mixing or kneading the dough, I hear a thump, I can walk away and it will be fine 15 minutes later. If the toddler takes longer to nap than I was expecting and the dough has risen for two hours rather than 90 minutes, in a lot of ways the bread will probably be better for it. I can start bread in the morning, leave it rise while I pick up elder daughter from nursery, come back, shape it, leave it to prove while she is at swimming class and put it in the oven when we get home so it is ready for us all to have for tea. That beautiful book was the key to me feel like I could get things done again. It also allowed me to model for myself the benefits of repetition. My bread got better as I did the recipe more often. The kids were more manageable as the routines got more familiar. Doing something many times made me better at it and allowed me to do it without thinking about it. At the same time, the toddler was earning her title and learning to walk. She kept repeating the same motions again and again and refining them. Together we showed off our new talents – her by walking in the garden, me by posting pictures of my bread on Facebook. I don’t want to end this on a Polyannna-ish note. I’m still not a perfectly patient mum. I still get frustrated with the kids and feeling like I never get to finish things. The kids still want more of my time than I am willing to give, and actually need slightly less but pretty close to my limit. But they are getting older and my bread is getting better and I no longer feel like I have nothing for myself. Which is what we all need, if it is just some plain white rolls. Or a misshapen baguette. Making feuilletée is a lot like that. 15 minutes of work left and right and two hours waiting in between. Doesn’t matter if it is two hours or overnight, actually, the longer the better. I spread it out over a day of doing this and watching TV that. The 15 minutes are intense and require repetition and skill to get the rolling and turning down, but the end result is totally forgiving: even mediocre feuilletée tastes great when freshly baked with some nutella on top. The step that takes longest is final rolling and cutting into shapes and filling, if that is what you want to do. I just roll out and add apple filling and into the oven. Thank you for this! Yes, the feeling of ‘achieving’ something might be the thing I miss most about being at conventional work full time. Now we work 24 hours and have nothing to show for it. I started making bread (wheat and dairy free in our case *glum*) and it really did feel like a substantial Something to show, especially since people see breadmaking as a time consuming, productive and impressive thing. I didn’t like to tell them I was using a Roman recipe that involves shoving things in and stirring and kneading at a level my toddler could manage helping with!